Strong beer is helping Carlsberg ride out of sluggish beer sales in India. At a time when the overall Indian beer market is growing at about 5% a year, robust sales of brands like Tuborg and Elephant have helped the Danish brewer double its local business every two years. Unlike most other markets, where Carlsberg's top seller is the milder version of the eponymous lager, the company's Indian unit has been focusing on brands such as Tuborg Strong and Elephant because strong beer accounts for 80% of country's overall sales volume of 300 million cases. "The growth can be attributed to the long-term strategy to focus on key markets, especially cities, focused brand portfolio, expanding manufacturing footprint, increased product availability and above all a strong team," said Michael Jensen, managing director, Carlsberg India, which reported a 54% increase in sales at . Rs 765 crore during FY15 with net loss of Rs 232 crore. However, despite the healthy sales numbers, innovations and aggressive product launches, Carlsberg's market share in India the world's third fastest growing beer market is one of its lowest globally. Tuborg, which was launched in the country as a premium brand in 2009, has now become the second largest strong brand. Carlsberg is the third largest player in India with 15% share, trailing market leader United Breweries, which is controlled by Heineken, which has 51% share, and SabMiller which has 23% share. "Most of the premium brands have done well in the last few years. Carlsberg seems to have taken share mainly from SabMiller and some fringe players since United Breweries has been consistent in maintaining its share," said Abneesh Roy, associate director at Edelweiss Capital. SabMiller, the maker of Haywards and Knock Out beer, clocked 1% growth in net sales at Rs 1,940 crore, and a net loss of . Rs 127 crore in 2014-15. UB, which sells Kingfisher beer, grew 11% at RS 4,692 crore in net revenue and profit of Rs 260 crore. The alcoholic beverages industry in India is heavily regulated, with excise and other taxes forming an important source of revenue for state governments. In states that collectively account for 70% of the industry's revenue, the government controls manufacturing, distribution, retailing and pricing of liquor. This makes it difficult for most companies to make higher profits. In fact, SABMiller, the world's second-largest brewer, has written down $313 million (. Rs 2,000 crore) of its investment in India last year, citing increasing regulatory and excise challenges. 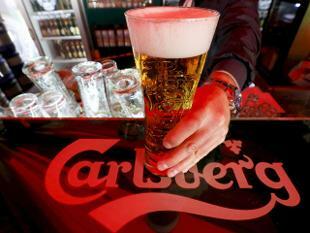 But Carlsberg is hopeful to be out of the red despite increasing its investment the company's seventh plant became operational last fiscal in Bihar and its existing plant in Haryana undertook capacity expansion.